This is an account of one of the most infamous murder cases in all of New Jersey. Forty years ago this month, John List, age 46, applied for a firearms registration for home protection. Two months earlier, his 16 year old daughter Pat has been picked up by the police for walking the streets after midnight and smoking. John’s wife, Helen, no longer went to church. John was sure that the family was going straight to hell. Their home in Westfield, New Jersey was a nineteen room, three story Victorian mansion and the most expensive home in the neighborhood. In December, 1971, a neighbor noticed that the List house had all of its light on for quite a while. It appeared abandoned to her, and she notified the police. The officers entered the house through an unlocked window. There was church music playing loudly through an intercom system. The furniture was gone. There were dark stains on the kitchen floor and on the wall of the pantry. As they walked through the house, a terrible smell got stronger, and the police officers followed it into the ballroom of the house. Near the fireplace, they found four bodies, placed side by side on Boy Scout sleeping bags. The bodies had rags over their faces, and there were trails of blood from where they had been dragged from other parts of the house. Pat List’s drama coach identified the bodies as Helen and her three children – daughter Pat, son John Jr., age 15, and son Frederick, age 13. Helen and Pat had both been shot in the head. John, Jr., had been shot multiple times in the chest and face. The body of John List’s mother, Alma, was found in the attic. She also had a rag on her face, and had been shot above the left eye. The police officers discovered a note taped to a filing cabinet with keys to the drawer which revealed two guns. Also inside the drawer was a large envelope addressed to the pastor of the List’s church. Inside were the List’s financial records. Another note was found explaining that he didn’t want his family to experience poverty and that he wanted their souls to remain pure in the future. 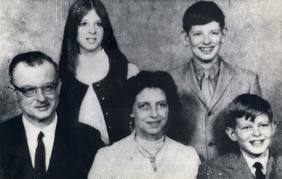 A five page confession was written by John List to his pastor, explaining how the family had turned away from God. List’s car was located at Kennedy Airport in long term parking with a voucher dated November 10th, and his passport was missing from the house. List was indicted on five counts of murder and on fleeing a crime scene across state lines by a grand jury in absentia. 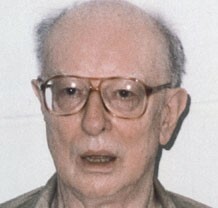 The search for John List lasted 18 years. List had changed his name to Robert Clark and worked as a cook at a hotel. He joined a church and fell in love and married a woman named Delores. By 1985, things started to fall apart. He lost his job and his position as a Sunday school teacher, and Delores started to talk about leaving him. Their dog was beaten to death outside their gate. Their neighbor, Wanda Flannery, got to know the “Clarks” pretty well. She liked to read tabloids, and, in 1987, read an article about John List in the World Weekly News. She recognized his picture, and told Delores about her suspicions. Delores tossed the paper out without saying anything to her husband. The couple soon moved to another city. Jeffrey Paul Hummel was a police detective who had worked on the List case. In 1988, he saw a new television program, America’s Most Wanted, and asked Captain Frank Marranca to bring the List case to the show. The show aired on May 21, 1989 and was seen by about 22 million viewers. List and Delores had gone to a church social that evening so they missed the show. But their old neighbor, Wanda Flannery, was watching. She had her son-in-law call the phone number on the show and gave them the Clark’s new name and address in Virginia. When police got to the Clark’s home, Delores told them that Bob was at work. They showed her the photographs of List. Bob was arrested at his place of business. List pleaded not guilty and his bail was set at $1 million. On April 12, 1990, List was found guilty on all counts. He was given five consecutive life terms in prison. In March, 2002, List was interviewed by Connie Chung for ABC’s evening magazine show “Downtown.” He said that he felt that he had a better chance of going to heaven if he murdered his family and sought forgiveness rather than just killed himself. He fully expected to see his family in heaven again. List died of pneumonia in prison on March 21, 2008 at the age of 82.